Vale Earth Fair 2012 - Another Cracker! Do you know your Ellie Goulding from Goldie Lookin Chain? Mumford and Sons from Son of Dave?? Then the Vale Earth Fair’s next fundraising event is for you. 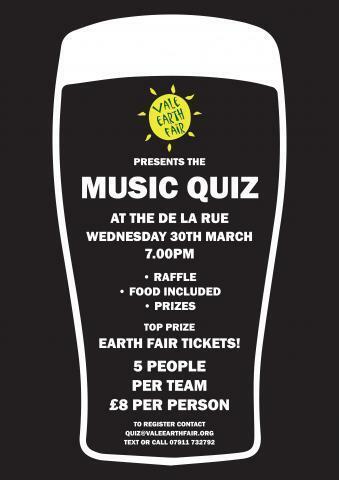 On Wednesday 30th March the Vale Earth Fair Collective is hosting its hugely popular annual music quiz…with a twist. Teams of 5 are invited to test their knowledge of all musical styles and subjects from classic pop trivia to a unique 'name that tune' round! Up for grabs is a variety of prizes, including tickets to the Vale Earth Fair itself and the coveted title of VEF Music Maestro!